“Maaveerar Naal”or “Great Heroes Day” was observed annually on November 27th in a grand manner by the Liberation Tigers of Tamil Eelam (LTTE) for many years in the past. 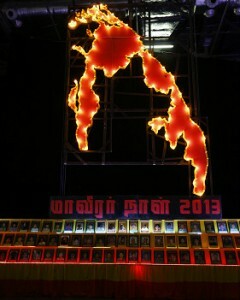 The yearly event lost its lustre after the military debacle suffered by the tigers in May 2009.Despite the LTTE ceasing to exist as a viable entity in Sri Lanka after the military defeat,tiger and pro-tiger elements in the global Tamil Diaspora and Tamil Nadu strove to retain the mystique of “Maaveerar Naal”by organizing various activities related to the Great Heroes Day abroad. This year however saw the Sri Lankan state reacting in a pre-emptive manner to prevent perceived attempts to observe the “Great Heroes Day”(GHD)under different guises in the North and east of Sri Lanka. The latter stages of November saw the security focus shifting to face the challenge of a suspected “Maaveerar Naal” revival threat.Rightly or wrongly it was felt that overt and covert moves were on to revive the fortunes of the LTTE by reactivating GHD observances. Sri Lankans in general and the Tamil people in particular have suffered immensely as a result of the prolonged war during past decades. The end of the war has seen the country progressing slowly yet steadily on the road to lasting peace and economic development. Under these circumstances the excessive reaction of the state to suspected attempts to revive the LTTE via” Maaveerar Naal” activity was understandable though with the wisdom of hindsight one may conclude that the official response was akin to using the sledgehammer to crush a gnat. The security related response aimed at preventing observances pertaining to the GHD has brought in its wake some criticism of the Rajapaksa regime.It is being charged that the Government in its bid to prevent a tiger renaissance, suppressed the right of the Tamil people to mourn their departed loved ones.The accusation is being levelled that the Tamil people desiring to mourn their dead were denied that basic human right.While the motives of tiger and pro-tiger elements in making such complaints is easily discernible what is troubling is the phenomenon of non –LTTE sections buying into this “politics of mourning”perspective either wittingly or unwittingly. Notwithstanding brazen efforts by vested interests to depict “Maaveerar Naal” falling on November 27th as a day of general Tamil mourning, it must be emphasised that the so called “Great Heroes Day” is not and has never been a national day of Tamil mourning.The “Maaveerar Naal” was an intensely conducted partisan event “of the tigers,for the tigers and by the tigers”. To portray it otherwise as some have done including stalwarts of the Tamil National Alliance (TNA)is sheer political hypocrisy. The role played by sections of the Tamil National Alliance in promoting the Great Heroes concept within the current milieu has been considerable. During its Northern provincial council polls campaign the TNA observed two minutes silence in honour of the ”Maaveerar”. 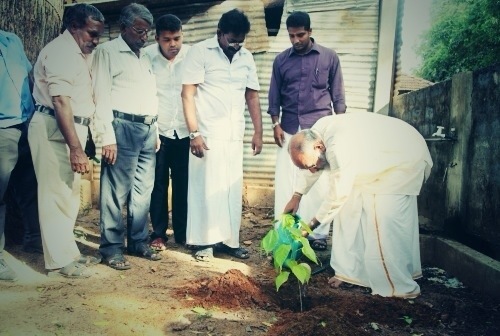 Some TNA candidates praised LTTE leaders and described them as Great Heroes.Chief among these was the TNA’s chief ministerial candidate.The TNA controlled Pradeshiya Sabhas of Karaichchi and Chavakachcheri passed resolutions calling for renovation of LTTE cemeteries. The conduct of the TNA regarded widely as a “moderate” political formation added to the threat perception of the state regarding the GHD.What is disgusting about the politics of mourning adopted by the TNA was the scale of political hypocrisy! The LTTE now hailed as “Great Heroes” has in the past killed hundreds of Tamils who belonged to the constituent partners of the present TNA configuration.The TNA as a single political entity is yet to publicly mourn their comrades and colleagues slain by the LTTE .Yet some TNA leaders display no qualms about celebrating fallen tigers as great heroes. What is worse is the deceitful manner in which Tamil political leaders and sections of the media foster the myth that November 27th is a date of Overall Tamil sorrow and that Maaveerar Naal is a day of national mourning for the Tamils.This does not mean that Tamils do not mourn the loss of their loved ones.They do!The Tamils have lost those dear and near to them in the communal violence of 1956, 1958, 1977, 1981 and 1983. They have suffered innumerable losses in many forms during the long years of the war.There cannot be a single Tamil living who has not suffered the loss of a loved one during the years of violence and war.What is unacceptable however is the deception to depict the “Maaveerar Naal” as a day of universal Tamil mourning. In order to comprehend this state of affairs better it is essential to delve deep into the origins of the “Maaveerar Naal” event and trace its development over the years.It is only such an insight that would reveal historically that this Great Heroes Day has not been a day of Tamil mourning and that current attempts to identify November 27th in such manner is a deceptive act and hypocritical exercise. In that context the evolution and growth of the Great Heroes day or “Maaveerar Naal”event makes an interesting study. I have in the past written several articles on the topic. This article therefore draws liberally from my earlier writings. The first ever Liberation Tigers of Tamil Eelam (LTTE) member to embrace death in combat was Sathiyanathan of Kambarmalai a northern village adjacent to Valvettithurai, the birthplace of Velupillai Prabakharan its leader. Sathiyanathan alias Shankar also known as Suresh died on November 27, 1982.This Shankar is different to the “Col”Shankar who pioneered the LTTE air wing. An outpouring of emotion both genuine as well as sycophantic emerged. The focus shifted from Great Heroes Day to the leader’s birthday. Some even thought that Great Heroes day was to celebrate the leaders birthday.Soon Prabakharan acted firmly and clamped down on all festive activity connected with his birthday. The week was for the fallen heroes and the red letter day of that week would only be November 27, the Great Heroes Day he decreed. Utilising its control of the north and parts of the east during the 1990-1995 period to the maximum the LTTE conducted elaborate demonstrations and events as part of observing the GHD.The week culminated in a grand function on the 27th at a special location attended by Prabakharan himself. With the passage of time GHD ceremonies became decentralised. Several observances would be conducted simultaneously but pride of place however was naturally awarded to the one in which Prabakharan participated. The LTTE also established several cemeteries called Maaveerar Thuyilum Illangal (abodes where the great heroes slumber). In some instances the bodies of LTTE cadres were actually buried in the spot In many instances it was not possible to bury the bodies of cadres killed .Each of the departed cadres was marked by a single tombstone.While these tombstones were laid out in neat rows, a pavilion commemorating them collectively with names and relevant dates was also constructed. The annual speech was also considered to be something akin to a policy statement by the LTTE.It was dissected by analysts to ascertain what the LTTE leader envisaged for the immediate future. In later years Prabakharan did not deliver extempore but read from a carefully prepared text usually written by LTTE political adviser Anton Stanislaus Balasingham. The flames at various memorials were lit by senior tiger commanders. All the ceremonies were attended by members of great hero families taken by procession to the various memorials from different spots. Music was played by troupes from different LTTE formations. The different venues were also decorated with pandals.The red and yellow flags were hoisted widely. Prabakharan thereafter accepted the flaming torch brought in relay form and went on to light the premier flame of sacrifice. After observing two minutes of silence along with the massive crowd in attendance, the LTTE leader garlanded a picture of Sathiyanathan alias Shankar the first great hero.Thereafter the LTTE leader accompanied by other tiger members lit the small lamps and placed flowers before the pictures of LTTE cadres. So great was the importance attached to the day that the LTTE opened a special office in Kilinochhi to handle the event as well as affairs concerning dead LTTE cadres and families. A retired educationist Pon.Thiyagam was in charge of this office.He is now reportedly living outside Sri Lanka. Even though the war has ended and the LTTE is no more in Sri Lanka the tiger and pro-tiger sections of the Global Tamil Diaspora continue to commemorate the event worldwide. November 27th therefore is an important date in the politics of mourning in which Tiger and pro-tiger elements indulge in.It would however be a grave blunder to assume that the “Maaveerar Naal”of the LTTE is a day of National mourning for the Tamils of Sri Lanka.